It started well. After a few hundred yards I lost sight of the lead bike which was reasonable given this race has always very fast and competitive runners. My GPS indicated 6:55 min/mile as a pace which was slightly slower than I was expecting on the bike path. Without pushing much, the pace slightly went down over the next few miles as I was catching and running along Rod Bien. 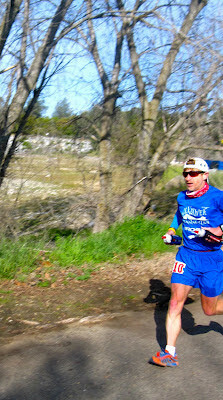 Lewis Taylor passed us when our pace was down to 6:40, then Phil Shaw. Both were targeting around 6:15-6:30 (that would be 6 hours and 30 minutes for the whole course, not a minute/mile pace). Rod finished in 6:20 (7th), Phil in 6:28 (9th) and Lewis in 6:39 (11th) so a good company to be in, pace and goal wise. We traded places while going through the first two aid stations (carrying two water bottles, I didn't stop), we were moving, life was good... Actually, around mile 17, before the bridge Nimbus Overlook, Rod asked how I felt and he had to ask twice because he couldn't hear my first response. Since my first asthma crisis at the Phoenix marathon in 2002, mile 16 has always been the place exercise-induced asthma would kick in from time to time. For the past 2 years I've been taking Singulair I came to the point of forgetting about this sort of wall. As a matter of fact, I thought about asthma at the start, with the chilly air, and ran the first mile with my Buff covering my mouth. Anyway, I could feel the lungs started not functioning and was hoping they'd hold on the remaining 30 miles of trails. Phew, gasp, ahhh, yikes, ouch, there aren't enough onomatopoeias to express how I felt after passing the line. Of course happy to be done with my 69th ultra race, thrilled to have managed to cover the distance under 8 hours given the circumstances, but so disappointed by this counter performance and the fact that this darn asthma kicked in again. Taking Singulair has certainly helped containing my handicap but obviously not completely eliminated it. And I know I shouldn't even complain, so many people are not even able to run a mile because of much more serious asthmatic conditions. Or others because of lung disease like Tom Kaisersatt. Overall, the conditions were perfect and, out of the 890 entrants, 686 are listed in the results on Ultrasignup. (I don't know how many of the entrants were actually at the start). Julie Fingar and her NorCal Ultra team did a very professional job to accommodate such a crowd with so many efficient, friendly and encouraging volunteers from the start to the finish and including the remote Buzzard's Cover aid station (special thanks to you guys!). 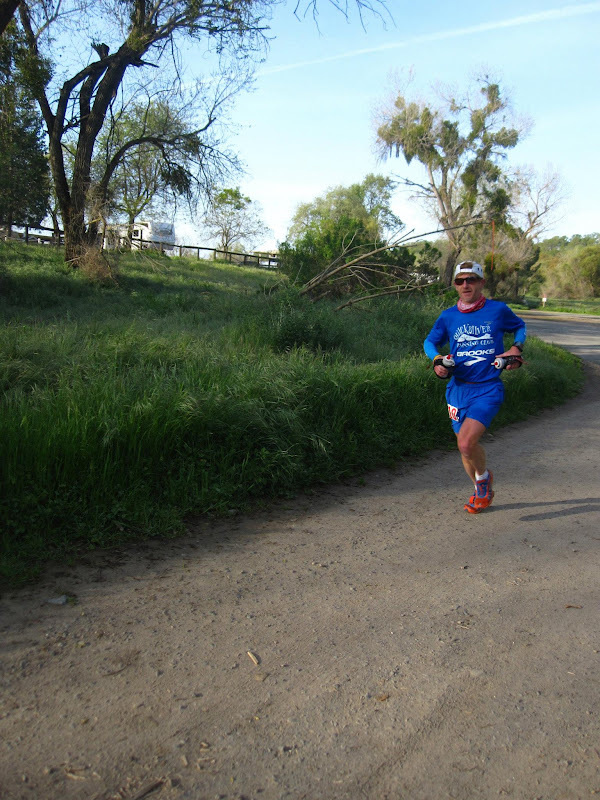 I want to also salute Tim Twietmeyer who finished less than a minute behind me for his 32nd finish out of 33 American River editions (just missing the first 1980 run and having ran 30 under 8 hours and 16 under 7 hours)!!! I'm heading to Madrid later this week and will be back for Ruth Anderson where I hope my lungs will behave and remain cooperative... Happy running to all in the meantime! désolée que l'asthme se manifeste à nouveau. 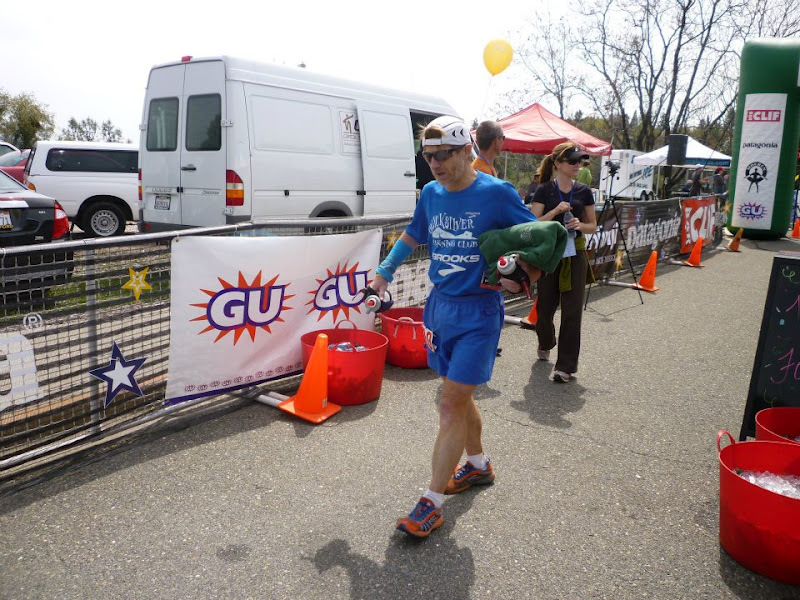 Ruth Anderson: 50 fast miles! Caballo Blanco: run free us all!